We all know how lovely Anne Hathaway looked at the Oscars, and if you went and saw the movie, you know how desperately wonderful she looked (and sounded) as the ill-fated young woman forced into sexual slavery in Les Miserables. What you probably didn’t hear much about in her acceptance speech(unless you watched the Oscars), was the hope that sexual trafficking would soon become a thing of fiction. The clip is a bit wonky, and taken from a camera filming from the TV, but check out minute 2:15 when she’s done thanking the immediate world. 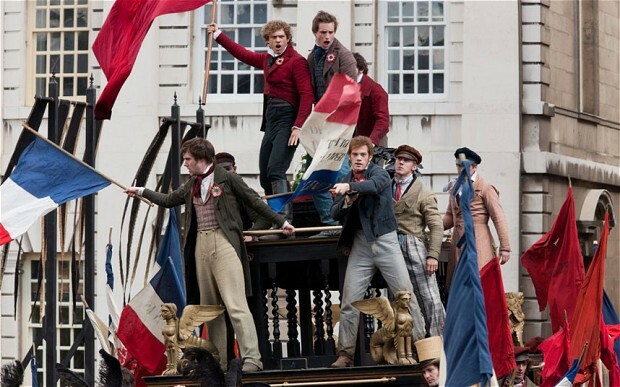 And moving onward, to the far more frivolous fare of fashion—didn’t you just love those Les Mis costumes?! Here’s how the genius Paco Delgado put together each costume and where he looked for inspiration. 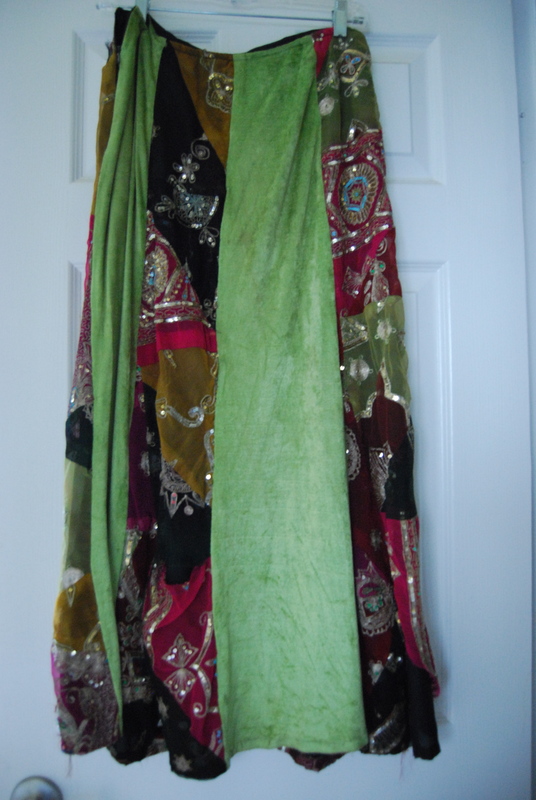 Find a long, showy and hopefully thrift-store skirt. Pick a color, any color. In fact, pick one with many colors. Find a top. Go simple on this one. A basic tank on hot days, perhaps a thermal shirt (I like to cut the necklines out of mine) for added warmth in cold weather. Invest in a jacket. This here is the pricier, more time-consuming element. Hunt down the gem on ebay, a thrift-store, estate sale, or get lucky, like I did. I bought my faux military jacket at Urban Outfitters about 10 years ago, (for about $30) thinking it was a flash-in-the-pan trend, but not caring because I wanted to look like Jimi Hendrix. And what do you know, the military trend is still going, even after My Bloody Valentine, et. all started playing county faire circuit (just kidding, MBV is still roaming around small clubs in Europe). 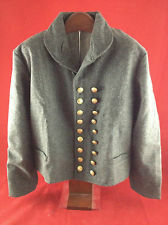 One great way to get a military-styled jacket, especially with all those nifty ‘musket ball’ buttons, is to special order it through a Civil War re-enactment costume specialist. Union or Confederate– your choice– no judgment. For early summer weather (which we seem to be having here) merely throw on those flip-flops, or any other understated hippie sandal. Note that copiously strappy or gladiator style might be a bit much—understated is the key here—your skirt should and jacket should be the showy pieces. If you like wrapping a thin little scarf around your neck, do so, and that would look chic. If you need to go for warmth, I recommend boots (like these, if you’re going fancy and you can afford it– $250+ sheesh, that’s pricey footwear! But I do dream of these occasionally, when the nights are cold and lonely…) or a peasant-y combination of clogs and leg warmers, especially if you get your leg warmers from Sock Dreams. Accessorize your upper limbs with arm warmers or fingerless gloves from them, too. Full gloves are warmer, sure, but a bit too 20th century for this look. To top it off—I love the pun here, forgive me if you don’t go for that kind of humor—a top hat, of course! I bought mine on ebay, searching with the word ‘Steampunk’. Needless to say, I could get lost in the word ‘Steampunk’ for about 3 days. 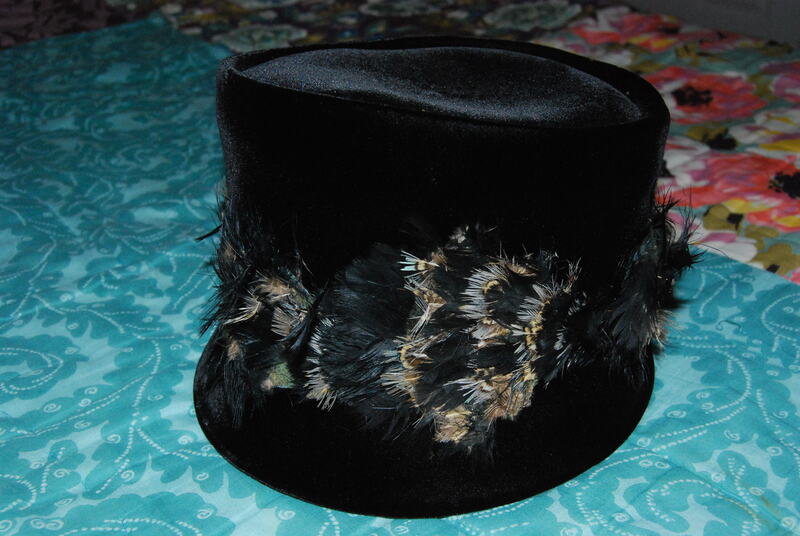 Originally, however, the hat was inspired by my book group’s reading of Anna Karenina (Leo Tolstoy wrote it, btw). I couldn’t help myself—I wanted to be Anna (romantic misfortunes notwithstanding) with a velvet top hat. Now, go out with your friends and family and be assured that you look fantastic. Next, do something about putting an end to sexual slavery and make the story of Fantine both fictional and strictly fashionable.